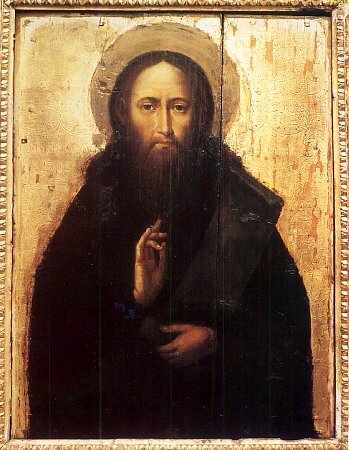 The Monk Theodosii (Feodosii) of Pechersk, was the initiator of a life-in-common ustav (rule) and a father of monasticism in the Russian land. He was born at Vasilevo, not far from Kiev. From his youthful years he felt an irresistible attraction for the ascetic life, and led an ascetic lifestyle while still in his parental home. He disdained childish games and attractions, and constantly went to church. He himself asked his parents to let him go to study reading of the holy books, and through his evident abilities and rare zeal, he quickly learned the reading of the books, such that everyone was amazed at the intellect of the lad. At 14 years of age he lost his father and remained under the supervision of his mother – a woman strict and domineering, but very much loving her son. She many a time chastised her son for his yearning after asceticism, but he remained firmly committed to his path. At 24 years of age he secretly left his parental home and took monastic vows, with the blessing of the Monk Antonii (Anthony), at the Kievo‑Pechersk monastery with the name Theodosii. After four years his mother found him and with tears besought him to return home, but the saint himself persuaded her to remain in Kiev and accept monasticism in the monastery of Saint Nicholas at the Askol'd cemetery. The Monk Theodosii toiled at the monastery more than others and not seldom he took upon himself part of the work of the other brethren: he carried water, chopped wood, ground up the rye-grain and carried the flour to each monk. On cold nights he uncovered his body and let it be food for gnats and mosquitoes, the blood flowed on him, but the saint patiently occupied himself with handicrafts and sang psalms. In church he appeared before others and, standing at a place, he did not leave it until the finish of Divine-services; the readings he listened to with particular attention. In 1054 the Monk Theodosii was ordained to the dignity of priest-monk, and in 1057 he was chosen hegumen. The fame of his deeds attracted a number of monks to the monastery, at which he built a new church and cells, and he introduced the Studite common-life monastic-rule (ustav), a copy of which was made by his commissioning at Constantinople. In the dignity of hegumen the Monk Theodosii continued to fulfill very difficult duties at the monastery. The monk usually partook of only dry bread and cooked greens without oil. The nights passed for him without sleep in prayer, such that the brethren often took notice of this, although the chosen one of God also tried to conceal his efforts from others. No one was to see when the Monk Theodosii dozed lightly, and usually he rested sitting. During the period of Great Lent the saint withdrew into a cave situated not far from the monastery, where he asceticised with no one seeing. His attire was a coarse hair-shirt worn straight over his body, such that in this old man looking like a beggar it was impossible to recognise the reknown hegumen, deeply respected by all that knew him. One time the Monk Theodosii was returning from GreatPrince Izyaslav. The coachman, not recognising whom he was, said gruffly: :Thou, monk, art always on holiday, but I constantly am at work. Get up on my place, and let me ride in the carriage". The holy elder meekly complied and drove the servant. Seeing how boyar nobles along the way bowed to the monk driving the horses, the servant took fright, but the holy ascetic calmed him, and upon their arrival gave him a meal at the monastery. Trusting on the help of God, the monk did not keep a large supply of food at the monastery, and therefore the brethren were in want of their daily bread. Through his prayers, however, unknown benefactors appeared at the monastery and furnished the necessities for the brethren. The great princes, and especially Izyaslav, loved to listen to the spiritual discourse of the Monk Theodosii. The saint was not afraid to denounce the mighty ones of this world. The unjustly condemned always found in him a defender, and judges would review matters at the request of the hegumen revered by all. The monk was particularly concerned about the destitute: he built for them at the monastery a special courtyard where anyone in need could receive food and drink. Having sensed beforehand his own end, the Monk Theodosii peacefully expired to the Lord in the year 1074. He was buried in a cave dug out by him, into which he secluded himself during lenten periods. The relics of the ascetic were found uncorrupt in the year 1091. The Monk Theodosii was enumerated to the ranks of the saints in 1108. From the written works of the Monk Theodosii there have survived to our time: 6 discourses, 2 missives to GreatPrince Izyaslav, and a prayer for all Christians. The Vita (Life) of the Monk Theodosii was compiled by the Monk Nestor the Chronicler, a student of the great abba, a mere 30 years after his repose, and it was always one of the favourite readings of the Russian nation. An account about the Monk Theodosii also is located under 28 September.